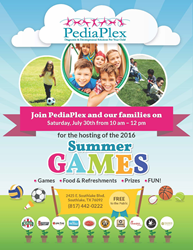 The 2016 Summer Games at PediaPlex will feature plenty of games and activities for children of all ages. We’re excited to have all the kids come out and participate in our 2016 Summer Games. There will be lots of fun activities and they will be able to end their summer vacation on a high note. It can be tough to find new and exciting ways to keep kids entertained and active over the summer. PediaPlex is lending a helping hand with a morning full of fun activities and delicious food for children and their families. The 2016 Summer Games will take place at PediaPlex on Saturday, July 30 from 10 a.m. until 12 p.m.
“We’re excited to have all the kids come out and participate in our 2016 Summer Games. There will be lots of fun activities and they will be able to end their summer vacation on a high note,” Founder and CEO, Sonia Kirkpatrick said. It is a great opportunity for children to play together and socialize with one another as they engage in different games, win prizes and have fun. They can stay active in a safe environment with game and activities everyone can enjoy such as bucket racing, egg racing, corn hole, basketball and more! There will also be face painting, a firetruck and opportunities for kids to take photos with their gold medals in front of our Summer Games backdrop. There will also be plenty of vendors at the event serving up delicious food. Vendors include Rita’s, Chick-Fil-A, Taziki’s Mediterranean Café, eatZi’s Market & Bakery, Einstein Brothers Bagels, East Coast Subs, Cinnaholic, Pollo Tropical, Smoothie King, Pie Five Pizza Co., and Cristina’s Fine Mexican Restaurant. Families are invited to join in the festivities and try their hand at the different games and activities. Having children participate can be a wonderful way to extend what they have been learning in therapy to a new environment. Parents can also learn more about play therapy, social skills training and other services available at PediaPlex to help their child become more independent and successful. Stop by PediaPlex on Saturday, July 30 from 10 a.m. to 12 p.m. to partake in the 2016 Summer Games and celebrate summer with exciting games, good friends, and delicious food! PediaPlex is an all-inclusive diagnostic and therapeutic clinic located in Southlake, Texas. It offers comprehensive services to children with a variety of disorders ranging from autism, ADHD, and sensory-motor problems to learning disabilities, mental health disorders, and developmental delays. Therapy services include occupational therapy, speech therapy, play therapy, psychology testing, cognitive and academic assessments, counseling and ABA therapy. The multidisciplinary team evaluates and diagnoses children to determine their individual strengths and areas of need and then creates a collaborative treatment plan to address these concerns. All services are offered in one convenient location.